There are about 20 FPC modules out there, each one’s goal is to provide full caching of pages of various types in Magento store. This produces a considerable increase of page load speed to use a pre-cached copy of a page instead of rendering a page anew. All such solutions share a common operational principle and, on the other hand, common problems: update of specific blocks, low speed in cart, complicated config setup of content update, slow first load of pages. Some developers decide to remedy these defects with help of different means: develop quick workarounds that eventually slow down page load from milliseconds up to a second, increase total cache volume (that can’t be contained in Memcached). Many solutions are designed to store data exclusively in the form of files instead of REDIS, work unstably and affect, in a bad way, the backend performance, in particular during a saving process. 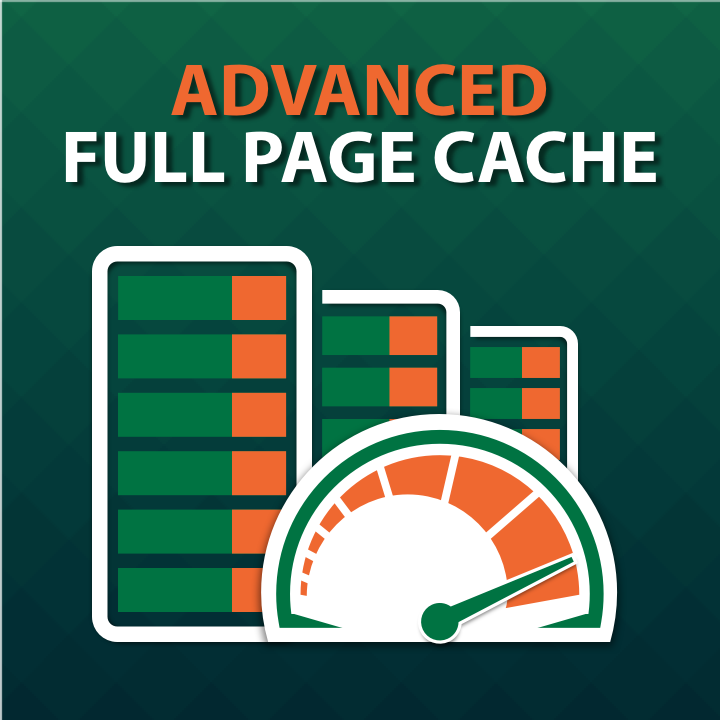 The SafeMage extension absorbs experience of numerous full page cache extensions as well as real practice of speed optimization works. It just works differently, offers simplified setup and is relieved from various weak spots of other FPC solutions. This Advanced Full Page Cache extension appears to be one of the fastest caching tools with minimal response time (~25ms) of cached pages. In fact this was our goal to make cached pages respond quicker than those cached by other similar extensions. Actual speed is ~25ms which is time needed by the server to return content. But to get real numbers, one should also take into account server ping and data transmission to end user. For more info, go to Network Timing. The extension also fully supports session's create and update functions. This part in many other solutions is often buggy and vulnerable being not ready for latest security patches. FPC processes only guest-session pages without products in cart. With such an approach, there is no need to store multiple pages in cache and hence negatively affect overall performance. The most prominent effect of use of the extension is SEO promotion in search results. 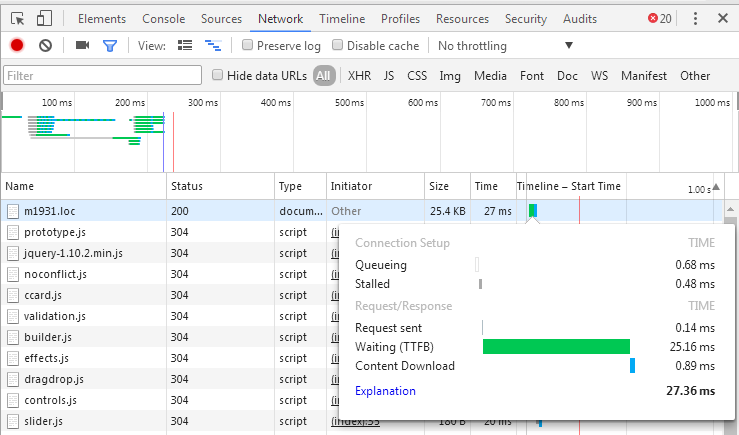 You know, Google does take into account page load speed. Apart from full page caching, the extension can also blocks, product models, collections and correctly update them. This all enables at least triple speed boost for non-warmed-up pages or customer-session pages with products in cart. One more advantage of the extension is universality of cache storing and updating of full page cache in the scope of Magento default cache management. This greatly impacts the speed of data saving process in the backend and spares difficulties to invent some side data storage systems introduced by other solutions. And thanks to this universality of cache storing, Memcached or REDIS can be integrated seamlessly. The extension features easy-to-setup backend configuration that doesn’t require any special knowledge and can't damage your website if set incorrectly. 1. Make a backup copy "index.php" located in Magento root and disable cache and compilation mode in the admin panel. 2. Upload the contents of the package to the server (Magento root). Note the package includes a new "index.php" file which should replace the original one. Make sure the new file is assigned the same permissions set for the original file. 4. 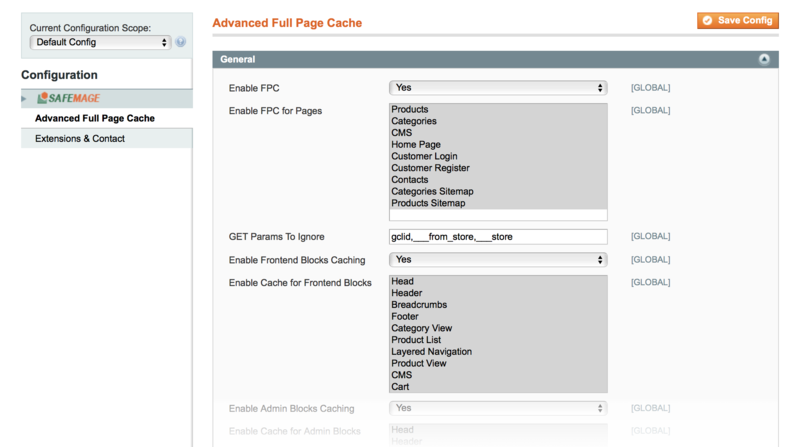 Re-log into the admin panel and enable Magento cache include the newly added "Advanced Full Page Cache". The config section enables admin user to add / remove pages and resources to cache in case of any issues with content updates. 6. Check performance of the front-end and its working capacity. Added support for product / category block caching with respect to customer groups. Added support for Safemage Timeless Reindex. Fixed an issue with collection cache not being reset after executing Mass Action in backend. Added support for MagPassion Quickview. Improved cache crawler's queue characteristics. Added a feature to minify HTML. Added the Cache Crawler that features queue priority, automatic queue update on product save, and manual or scheduled (via cron job) warm-up. Fixed an issue with the Wishlist and Compare functions. Improved compatibility with Google Analytics. Fixed a Magento bug related to session form_key in cached blocks. Fixed an issue with renewal of cached collections. Fixed an issue with “_addUrlRewrite” with cached collections. Fixed an issue with customer log in procedure. Fixed renewal of session form_key. Improved product page view with session messages. Added compatibility with Magento CE 1.6.x. Added compatibility with the latest security patch addressing session issues. Added the setting GET Params To Ignore. Improved performance thanks to optimized session initialization. Fixed an issue with SID session and form key. Added new functionality: full page caching. 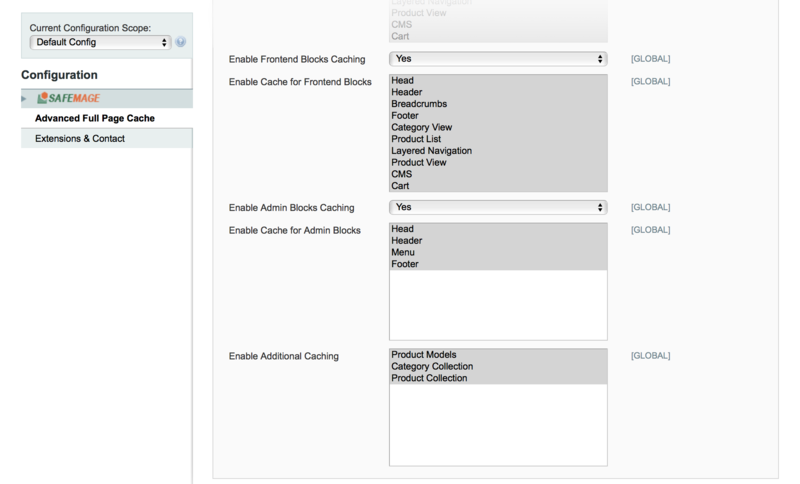 Added additional caching for category and product collections. Added front-end product models caching. Fixed an issue with configurable or bundle product refresh when saving an associated item of a respective configurable or bundle product. Fixed an issue with changed title in “head” block. Fixed an issue with caching blocks with session messages. Fixed an issue with cached CMS blocks with store code. Fixed an issue with cached blocks on HTTPS pages. Fixed an issue with blocks refresh. Initial release featuring speedy block caching. I was comparing quite a number of FPC extensions paying attention to the time to first byte (TTFB) value - this is how you find winner. Surprisingly, more expensive extensions lost in this battle to the Safemage FPC. Pages and blocks are updated correctly, no problems found.